GRANGEVILLE — The Boise Fire Department and Idaho Army National Guard members rescued some people from a home near Grangeville Tuesday due to rising flood waters. “We were just practicing some hoisting procedures where we were taking firefighters in and out of the helicopter to practice their recovery,” said CW3 Nathan Spaulding, U.S. Army. “Two hours into it--an hour into and we got a call for some stranded civilians up North of Grangeville,” said Captain Andy McFarland, Boise Fire Department. Five people were trapped in a home because of a flood. "Clearwater River had hit a flood stage a couple hours previous to us being called,” said Spaulding. 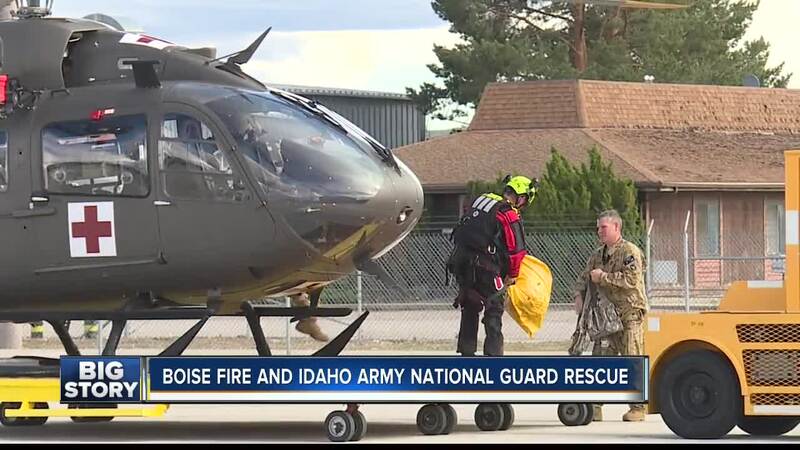 Boise Fire Dive members were sent down in a seat from the helicopter to rescue. This is only the second year of this kind of training here at Gowen Field. “We train with our divers specially for these types of responses,” said Steve Rasulo, Boise Fire Department. “It doesn’t happen often, but it’s an ideal way. This is our first joint mission with those guys, and so this was a really ideal way to kick it off and see what we were capable of,” said McFarland.